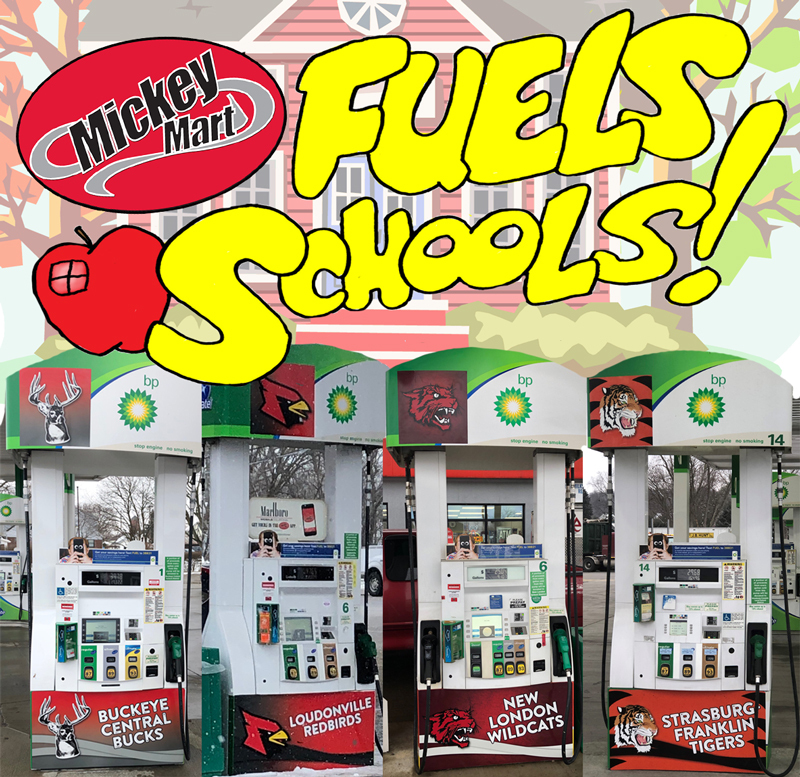 Mickey Mart Fuels Schools in 2019! The Mickey Mart Fuels Schools Initiative will designate 5¢ from every gallon of gas sold at one specially marked pump, for the entire year, to local schools! Congratulations to 2019’s selected Mickey Mart communities, Strasburg, New London, New Washington, and Loudonville. The Special “Fuels Schools” Pump will be available at these local Mickey Mart locations until December 31, 2019. The total collected will be used to provide scholarships grants to high school seniors in each of those communities. The more those pumps are used, the more goes to students! Follow Us on Facebook to learn how you can Nominate Your School for our 2019-2020 Mickey Mart Fuels Schools Initiative beginning in July! Next year’s winning school systems will be announced on Labor Day Weekend! High School seniors are encouraged to contact their school’s scholarship coordinators or guidance counselors for information on how to apply for any available scholarships or grants. Mickey Mart is a Family Owned Convenience & Fuel Store chain based in Milan, OH. The company is represented by their resourceful mascot, Mickey the Moose. The seven-foot presence of Mighty Moose Awesomeness welcomes customers at the door of nearly every location. Mickey Mart is proudly supported by Coles Energy, providers of consumer and industrial fuels and lubricants. Many Mickey Mart locations also provide Subway, Taco Bell or Dunkin’ franchises or services. CLICK HERE to find a Mickey Mart location near you! The heart and soul of Mickey Mart’s corporate philosophy is dedicated to becoming a proud participant in the lives and growth of our communities. We are excited to serve you in whatever way we can! For more information or if you have additional inquiries, please CONTACT US! If you’ve been working for any length of time on reaching Goals, you know it doesn’t take long for Overcoming Obstacles to become a thing. What’s important to remember is, this is just part of the process. 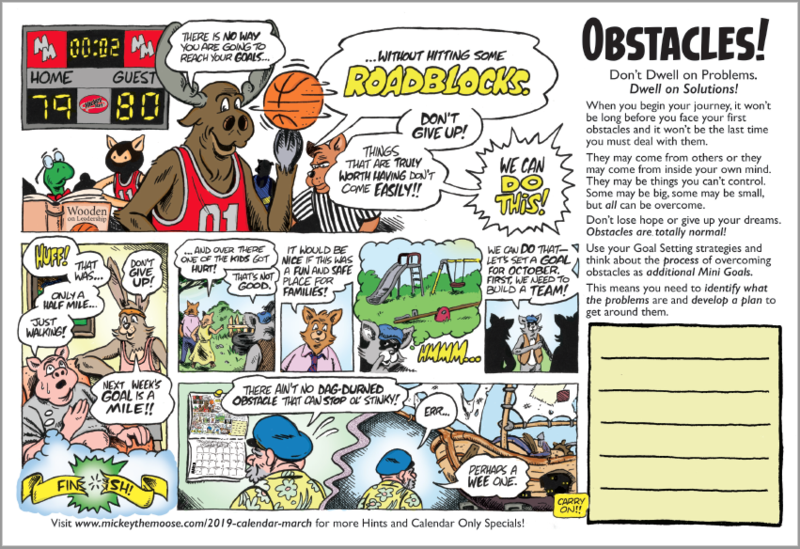 Chances are good that within a few days, perhaps a few hours, of starting towards your Objectives, Roadblocks began popping up. They come from everywhere. Sometimes they are simple to deal with, sometimes they are major problems. One thing is for sure, you need to be Overcoming Obstacles to keep moving forward. Here are a few strategies for dealing with Roadblocks threatening to derail you from reaching your next milestone. One of the important concepts behind achieving your goals is the documented ability for your brain to start making reality conform to your visualizations. There is nothing metaphysical about it, it’s just a manifestation of the process of overcoming barriers. Look at barriers and obstacles as the work you have to do to make your dreams more real because that is exactly what’s happening as you overcome them! Use the Goal Setting skills you are developing to break down the barrier by the same step by step process that you are using for your goals. Often you will find barriers fall apart quite easily once you begin the process of dismantling them. The idea is that ducks tend to say the same thing over and over again. You can’t get much useful information or any real value out of the time you spend with them. Learn to recognize when you are being distracted. As strange as it may seem, it’s not unusual to feel a little apprehension even though you appear to be having many successes. Most people don’t like too much change. Again, this is completely normal. Take a look at the barrier and determine if it’s you, yourself, who might be making it harder to get past. If your dream to swim the English Channel is being thwarted by your need to first learn how to swim, then it’s time to make a few adjustments. Of course, your ultimate goal can still be to swim the Channel, but you will put more focus into overcoming that obstacle of learning to swim. It basically becomes a Goal in itself and you need to treat it like one. UPDATE: Dirk’s Goal! Overcoming Obstacles! Item #5 (above) is applying to my goal of making a film by the end of the year (see last month). It’s my version of wanting to swim the English Channel. Figuring out how to pay for it is the learning to swim part of that. I set a goal of March 15th to have a script available that I could start breaking down to figure out a budget. This is the big reality wake-up call for an independent filmmaker. One can be one’s own worst enemy while writing a rough draft of a script. I kept thinking about how much it would cost to do this or that and it slowed me down. Of course, this had to stop or else the script would never get written. My rough drafts are usually everything plus every sink in the house. This, my Mighty Moose Overcoming Obstacles Allies, is going to be a low budget production. We aren’t going to be able to dazzle with SFX. We have to be more attentive to our story than anything else. There are many great examples of high quality yet very low budget story intensive films. The Blair Witch Project, Primer, Clerks, and Eraserhead are some excellent examples. If I can get a script done and a budget created by the end of March, I should still be on track. Ha! If. Next month we talk about Habits and if this is going to work, that is huge. We also have a lot of amazing stuff going on at Mickey Mart this year. I’m very excited about all that, so I have to make sure there’s enough time to do both! Phew! If you are like most people, you might be having some trouble selecting just one of the goals you thought you might be interested in from last month. There is no reason why you can’t have a few smaller goals to go along with your big goal, but don’t let yourself get overwhelmed. Part of the Goal Setting process is to be able to focus and visualize your goals. Too many things going on will crowd each other out and nothing will get done. For the purpose of this year’s calendar, let’s pick just one or two goals and make them a reality before we start on others. – I want to travel to Europe in September. – I’m going to run in my first 5K by June. – I want to find a new job by December. Whatever your goal, large or small, first set a Final Deadline. Be sure to write it down on a specific day in your calendar (remember, always write things down). Once you’ve set those smaller deadlines, lock them into your head! You need to ABSOLUTELY BELIEVE you can reach EACH goal. Visualize not only the Final Goal but each individual part of the goal. Your mind wants to make the things you are visualizing real. Help it along! And so on, until you reach your objective. We have a few printed Calendars left in Mickey’s Web Store! Get them while you can, or download our FREE PDF VERSION! From the goals I outlined last month, I have decided to pursue the opportunity to make a film. Filmmaking is a complicated process that often takes much longer than a year, but I am going to design a project that I can premiere on December 1st. I have a little advantage in that I have a great deal of experience and training in film and video production, so I’m not exactly starting from square one, but it’s still a huge goal. Here’s how I’m going to break it down. Each of these steps is broken down into smaller steps and there are a few other things in there that I haven’t included here, but that’s the basic plan. It’s an incredibly ambitious plan and a huge undertaking, but I believe, following the Goal Setting Plan outlined in the Goal Setting Calendar, I can do it. Helpful Hint: I will use my calendar exclusively for this particular goal. Whenever I have ideas or make notes, I tape them into the calendar on the relevant month so I can include them in the ongoing plans. If I get an idea about, for example, budgeting, I’ll tape that note into March so I’m not losing focus on the things I need to get done in February. Join us back here next month as we take a look at Facing Obstacles! We want to hear about your progress! Write to us at moosecomics@gmail.com and let us know how you are doing! Brrrrrr. It’s that time of year in Northern Ohio. Here comes the dreaded “Polar Vortex” and the dangerous subzero temperatures it generates. 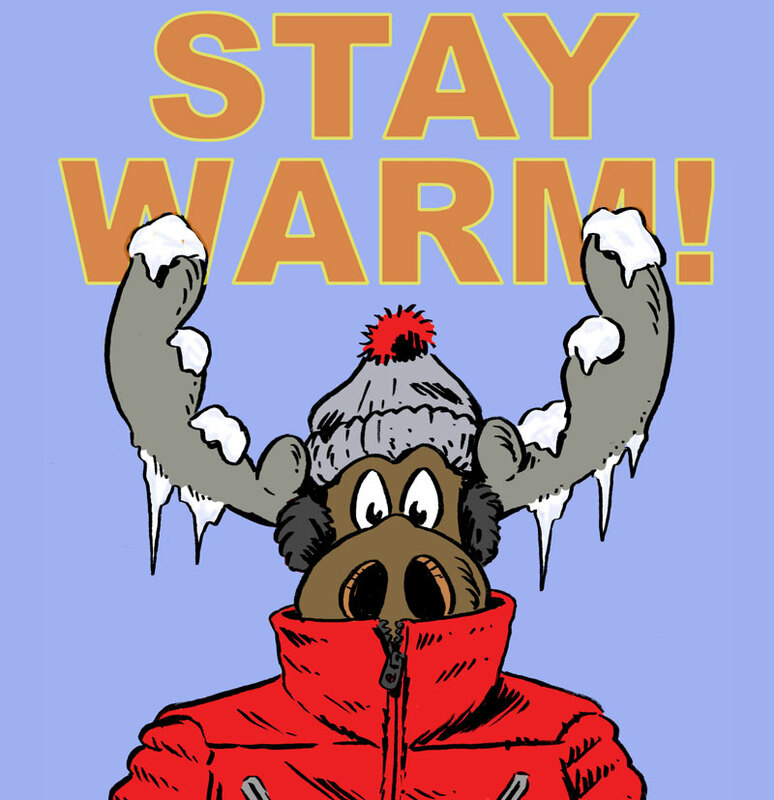 Mickey Mart wants you to stay safe and warm, so the best advice is to stay indoors and binge watch some TV or read a book. 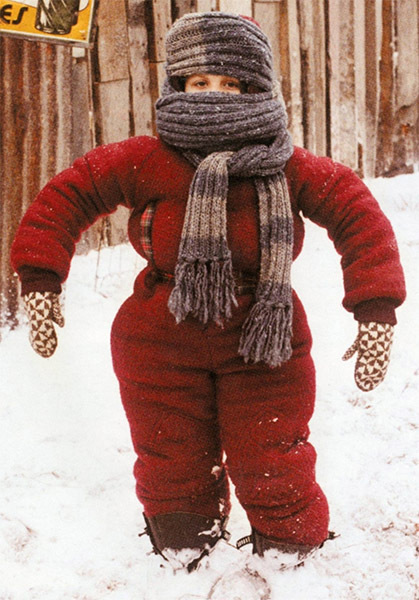 However, if you have to go out, here are 5 Easy Safety Tips For Frigid Cold Weather. This is the cold weather tip that never gets (c)old. No article on safety tips for the frigid cold should be without it. If possible look for synthetic materials, fleece or wool instead of cotton, especially for base layers closest to the skin. If you are working outside and sweating (as weird as that sounds), cotton absorbs the dampness with no insulating benefit. This can quickly become dangerous if you find yourself stuck outside or not moving for any extended amount of time. It also very helpful if the outermost layer has some kind of windbreaker quality. Anybody who watches weather updates knows how Wind Chill makes things much more challenging. Pay special attention to your hands and feet. If possible, avoid cotton socks, especially if there’s any chance they might get wet. Frostbite is always a real danger, exponentially so when the temperatures drop below 20 degrees. We’ve all heard the old saying that you lose most of the heat from your head. That’s only true if your head is uncovered. The truth is you lose heat from any unprotected part of your body. When temperatures get as low as those generated by the Arctic air we see every winter, exposed skin can freeze very quickly. Most often we are able to move from one heated location to another fairly quickly, but common sense says be prepared for every eventuality and put on those gloves, that hat, and that scarf (or at least be able to grab them quickly) if you are spending any extended time out of doors. One of the best safety tips for frigid cold is, if you are feeling the dread chill, a cup of hot tea, hot chocolate, soup or coffee will start the thawing process much faster than waiting for the car to warm up. Stay away from alcohol, if you are going to be outside for extended periods of time. It can actually lower your core temperature! All Mickey Mart locations are ready to serve you your favorite Hot Beverages. Find a Mickey Mart near you by clicking here! Along with normal winter safety gear, it’s a good idea to throw a low-temperature sleeping bag or a bunch of warm blankets into the trunk…just in case. If your car becomes disabled as a result of cold or snow and you’re any kind of distance from a warm shelter, it could be a while before anybody can show up to help. Make sure you have enough for everyone that could be in the car. If you are traveling long distances, it’s also a good idea to grab a couple of bottles of water before you leave the house. Water left in the car will, obviously, freeze and that won’t do you any good. A little emergency bag of snacks is a great idea, too. Again, your local Mickey Mart can certainly help you in this preparation! Dangerous temperatures can be difficult for older, more dependent neighbors. If you know of anyone who needs special assistance, be sure to check in on them to make sure they are OK and they have the means to reach out to someone if they find they need help. Unless dogs are wearing special booties to protect their paws from the cold and ice, limit walks to no more than 10 minutes. If you take care of animals that remain outdoors, make sure they have some kind of shelter and bedding which can provide a measure of insulation. Also, check that water sources remain filled with unfrozen water. For more safety tips for Frigid Cold Weather, here are the CDC’s Emergency Winter Weather Supply Lists. It’s January – Let’s Get Started On Some Goals! Welcome to Mickey’s Goal Setting Calendar Club! We’re glad you’re joining us! We are going to have an amazing year! We, the intrepid explorers of Moose Monthly Method of Goal Setting, are instead going to be applying strategies for reaching dreams that may have always seemed impossible! Big words, huh? Real tough talk from a bunch of letters on an internet post. Well, let me introduce myself. 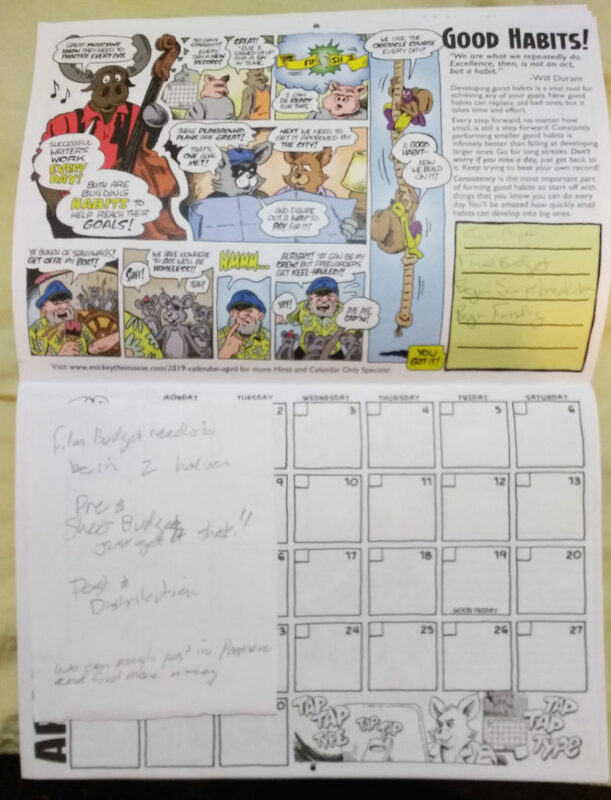 My name is Dirk and I’m one of the creators of the Mickey Mart 2019 Goal Setting Calendar. You may know me as the writer of all the Mickey the Moose Comics (What? You haven’t read them yet? That’s OK, they’re available at all Mickey Mart Stores or you can get them RIGHT HERE from our website). 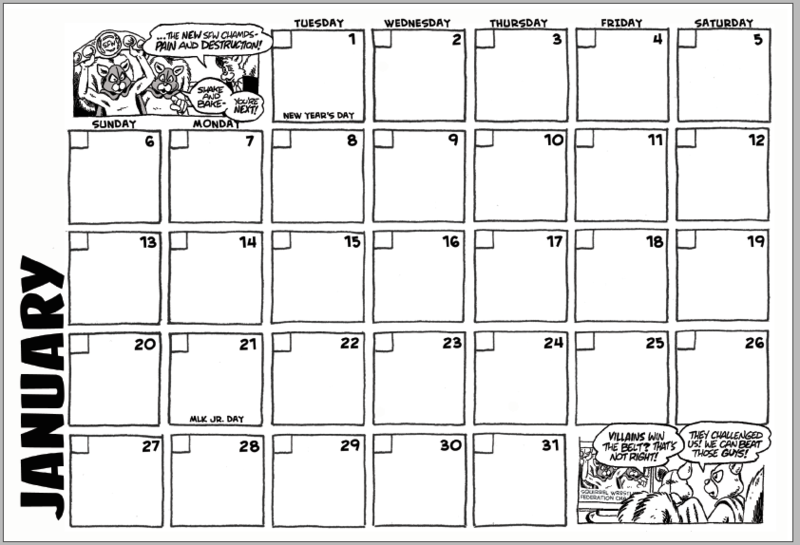 Anyway, at Mickey Mart, we believe in this calendar and believe it can help you do some amazing things THIS YEAR! I, personally, believe this so much that I’m going to choose a wild, insane goal that seems impossible to me and I’m going to put my reputation on the line to achieve it by the end of 2019! So What Do We Do In January? Only 2 Things! First, take it easy and relax. You’re not responsible for anything but dreaming. We’re going to start sorting through our options and try to figure out what is really important to us. 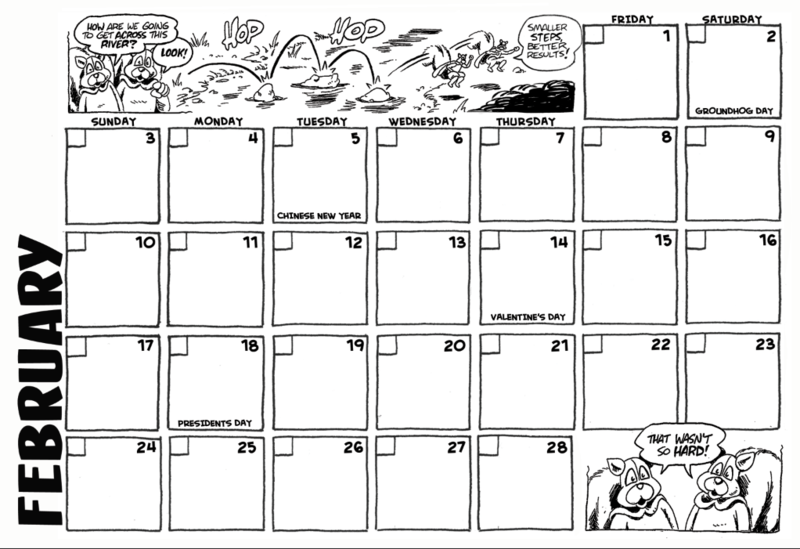 Take a look at the calendar and check out some of the things Mickey and the gang are dreaming about. Write down some ideas in your calendar. We’ll worry about picking our final goals next month. Second, starting to develop good habits is vital to achieving your goals. Here’s the problem, if you try to do too much too fast, you will likely fail, so we are going to do just the opposite. Start with a one or two (no more!) SMALL habits and strive to do them every day! It’s more important to Train Your Brain by developing a Daily Routine than anything else. For example, if you need to get in shape, create a daily routine of doing AT LEAST one push-up a day. On days you can do more, go ahead and do more, but never go to bed without doing at least one! If you want to be a writer, Train Your Brain by committing to writing only 3 sentences EVERY DAY. Again, if you write more that’s great! What’s important is you never end your day without writing those 3 sentences, even if it ends up being nonsense, do it anyway! Don’t try to develop too many new habits at once! Stick with no more than one or two at a time. When you feel like one is pretty ingrained, then you can start a new one. Write them down! Keep track of your habits by marking the days off in your calendar. GO FOR STREAKS! We have a lot of surprises in store for you. We’re planning videos, podcasts, special comic pages, newsletters, and much more, so follow Mickey Mart on Facebook, Instagram, or Twitter for updates. We will be using the hashtag #moosegoals quite a bit, so keep an eye out for that. Hold On, Dirk! You’re On the Hook! Write and Direct my own Independent Film! Mini-Goals to reach this goal: I need to write it, find financing, produce and edit the film. Backpack in the Swiss/Italian/Austrian Alps for a Month. Mini-Goals to reach this goal: I need to figure out how to pay for it, get in shape and clear off a month (that does seem impossible). I’ve always wanted to play the Ukulele. I’m not musical but I do own a Uke. I’m going to commit to practicing just 5 minutes every day. I really need to get into better shape, so I’m going to do one of the things I mentioned above, AT LEAST one push-up a day. Join me here next month to find out which one I’ve decided on and how my habits are going. We also want to hear what your goals are, so be ready to share. Don’t have your 2019 Calendar yet? We can fix that! Check with your local Mickey Mart for Availability HERE! FREE PDF Download Available HERE! Extremely Limited Number of Print Copies Available in our Webstore HERE! 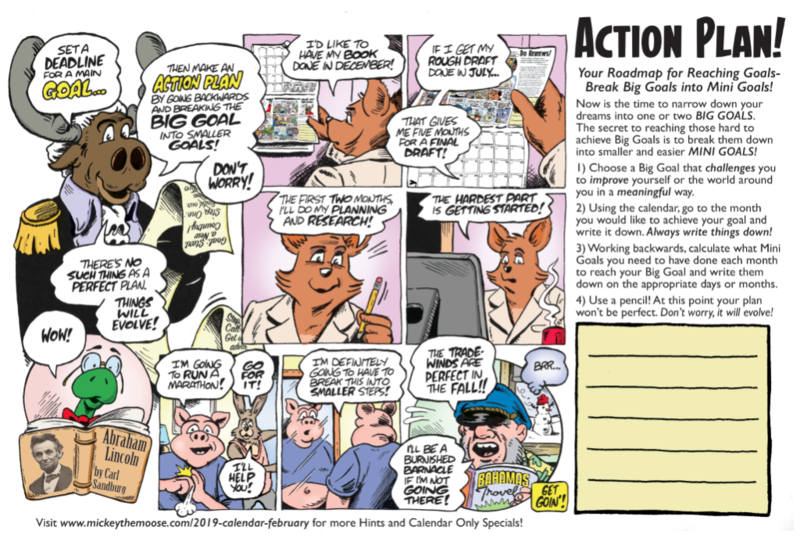 Achieve Your Dreams With Mickey Mart’s 2019 Goal Setting Calendar! 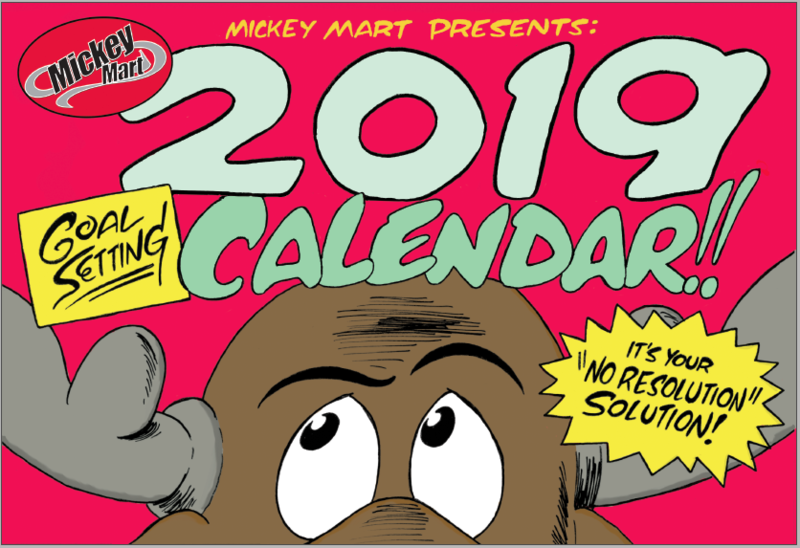 Mickey Mart has announced the release of the Mickey Mart 2019 Goal Setting Calendar! The calendar is available ABSOLUTELY FREE at all Mickey Mart locations on November 23, 2018, which is also Black Friday. Quantities at each location are limited so people interested in picking one up are encouraged to brook no delay! 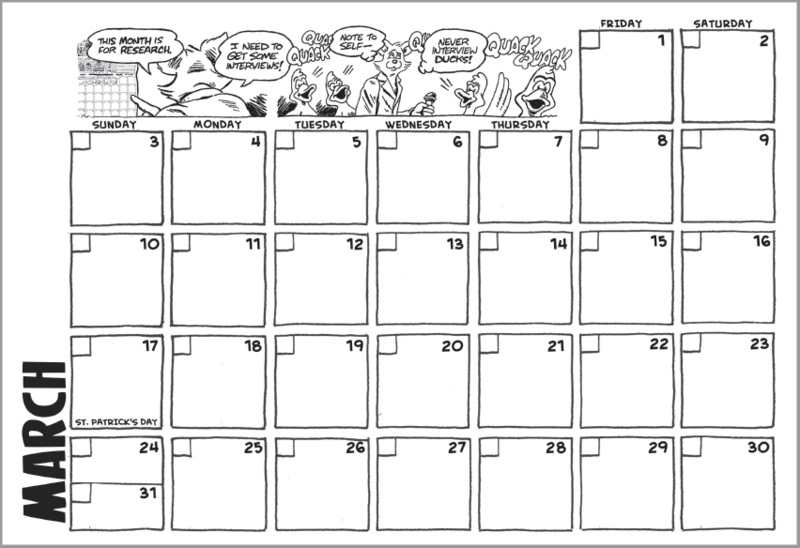 The 28-page calendar focuses on well-established strategies for helping you achieve goals you may have thought were impossible. The calendar is loaded with helpful tips, inspirational quotes, and great stories, each illustrating a particular strategy. Each month, calendar users are encouraged to build on what they have accomplished in previous months. There is plenty of room on every page for all your normal calendar needs, but there is also space to make set your own goals and track your progress in achieving them. 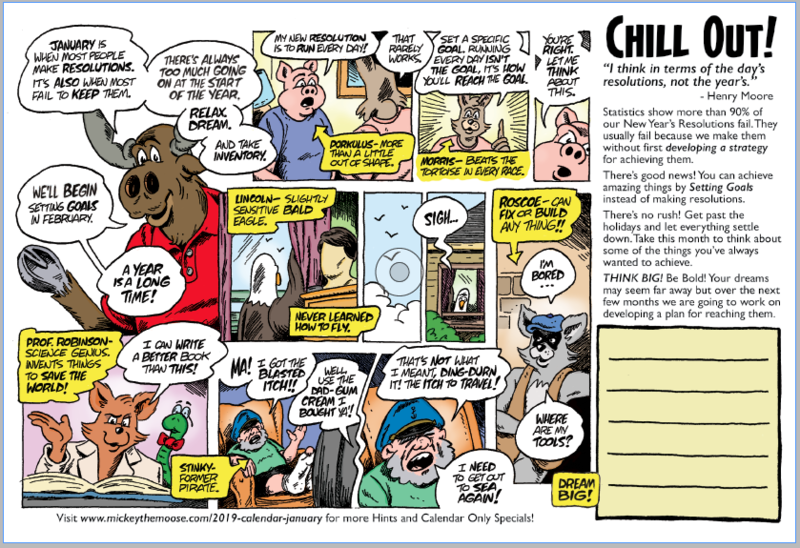 You can follow along as characters from the sold-out Mickey the Moose comics work through their own goals in humorous and timely sequences. In January 2019, Calendar users will be able to Join “The Mickey the Moose Goal Masters Club” where they will be able to share their experiences and achievements with other users. They will also find addition tricks and hints, special “calendar only” deals and all sorts of other fun and useful stuff! Don’t get left behind! Get your calendar NOW at any Mickey Mart location!